As planned, we didn’t spend a lot of time in Pamplona. 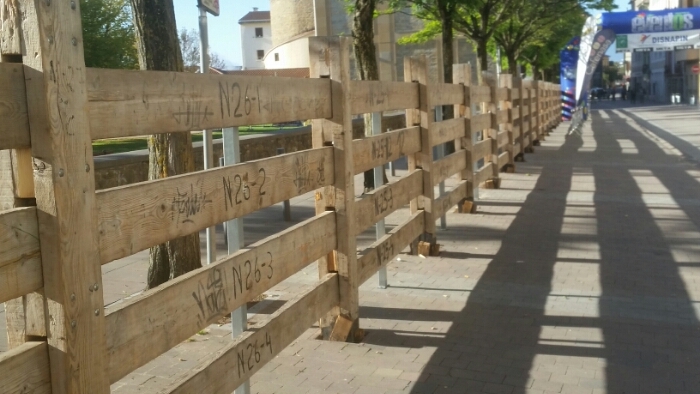 We did see strong wooden barriers set up, clearly to channel bulls or something similar. Yet I’m pretty sure the main “running of the bulls” festival is some other time. I get the impression that this is a different event. I asked an elderly woman about it, but only understood part of her response, and instead of “toros,” she used the word “vacas.” Meaning there is a “running of the cows.” Spain is a wonderfully mysterious place. This third hiking day was our easiest so far. We finished just 5 km beyond Pamplona in a little town called Cizor Menor. We’re starting to see some of the same people. 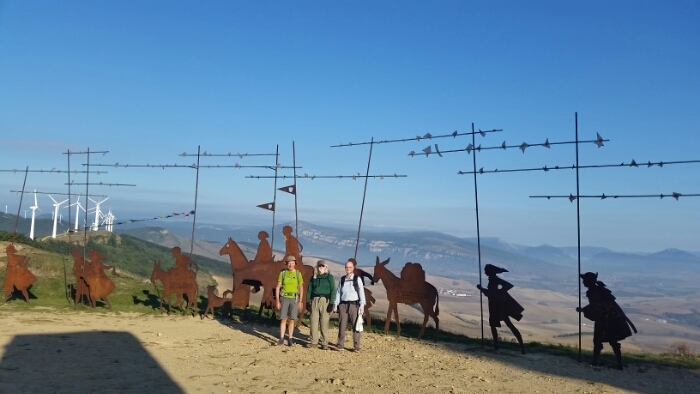 We hiked some in the morning with the same American woman we hiked with on day two, but she stopped for the day in Pamplona. We finished the day with a Philippine fellow Lucky’s age and a recently retired Australian school teacher about my age that we had dinner with the night before. Both are fun to be with. My very limited Italian failed me with a fellow named Francisco in our sleeping room but via mixing languages we got some things across. Some French folks I met speak some Spanish so we could communicate. Sometimes in these places folks form distinct and quite separate groups based on language, inevitable leaving some feeling isolated. However, with a little effort, a smile, and some patience, these barriers can break down, leaving a much more comfortable and friendly ambiance. Day four (September 28th) dawned clear as another day in Paradise – perfect weather. We had planned on an easier day, to stop in Puente de la Reina (“Bridge of the Queen”). After a nice meal there, we (which at this point included a younger American woman named Elisabeth and a lady from Australia about my age) all felt good enough that we decided to push on another 3 – 5 miles (depending on where we could get lodgings). So we ended up doing about 15 miles in total today, staying at the small (just 12 beds) Albergue named Lurgorri in the town of Maneru. Since our group represents almost half the capacity it’s a very comfortable ambiance. Later, our Italian friend Francisco showed up, so I was able to practice more of the patois I’ve been using with him of Italian, Spanish and English. Molto bene! I’ve been telling people that my goal for each day is to have at least one extensive conversation with someone either from a different culture, or who has had some distinctly different life experience. Today it was Elisabeth. Up until recently she worked for two years doing humanitarian work in South Sudan. I asked her if she could think of cases where she was certain her organization did some net good. She said that, as an example, they were so successful in distributing measles vaccine that it was just eliminated where it had been a major fear. It’s such a privilege to have the chance to walk and talk to such people. My legs are getting stronger, but at this point at least, Milky remains the strongest of us three. Not by enough to make a big difference, however, and we’re all having a great time.